Ominous clouds began to cluster above me, the latest display of a stretch of unsettled weather in St. Louis, Missouri. It had started a few days prior, when my arrival was delayed as my flight circled over the Gateway to the West, waiting for the ferocious storm below to finish shooting golf ball–sized hail at the city, shattering the windshields of thousands of cars and denting aluminum siding on countless houses. With a new sinister threat now brewing, I was delighted to be standing at the entrance of a cemetery. 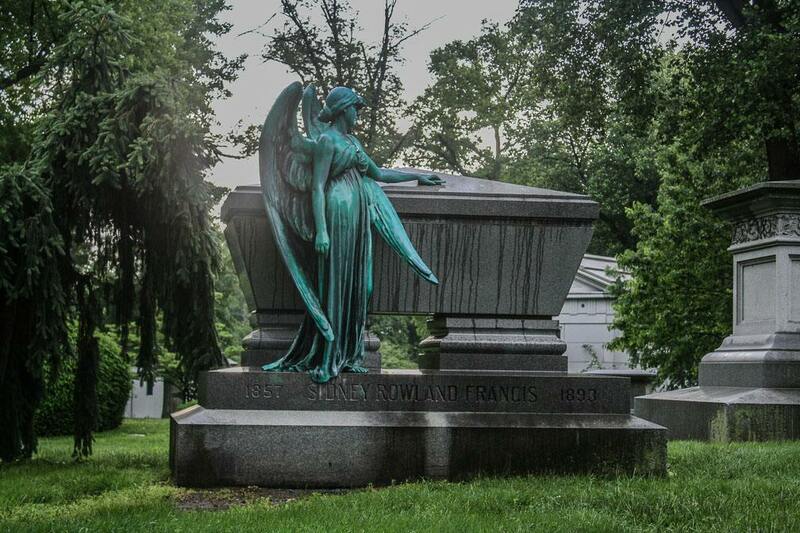 Beautiful tombs and sculptures abound in Bellefontaine’s 314 acres. The staff at the office of Bellefontaine Cemetery provided me with a friendly welcome, a map, and the pen they used to indicate the gravesites of the more famous burials. “And good luck with the weather,” they added as I prepared to leave. Choosing wheels over feet as my mode of transportation, I had driven only a minute or two when a strikingly bright flash of lightning and a resonating clap of thunder introduced a torrential downpour that challenged my windshield wipers. I felt it was prudent to pull over for a bit. What better setting to enjoy a great thunderstorm? Cemeteries are one of my favorite places to visit, and that’s not as macabre as it sounds. Their grounds are idyllic and peaceful, they’re often bursting with beautiful sculptures and monuments that range from whimsical to heartbreaking, and they get you close to some of the deceased who not only influenced their community but in many cases changed the world. William Clark, half of the dynamic duo of Lewis and Clark, rests in St. Louis long after his arduous journey to the Pacific. Bellefontaine is one such place. In the first half of the 19th century, the notion of a rural cemetery, set away from the bustle of a city and not in a churchyard, was just beginning to take root. 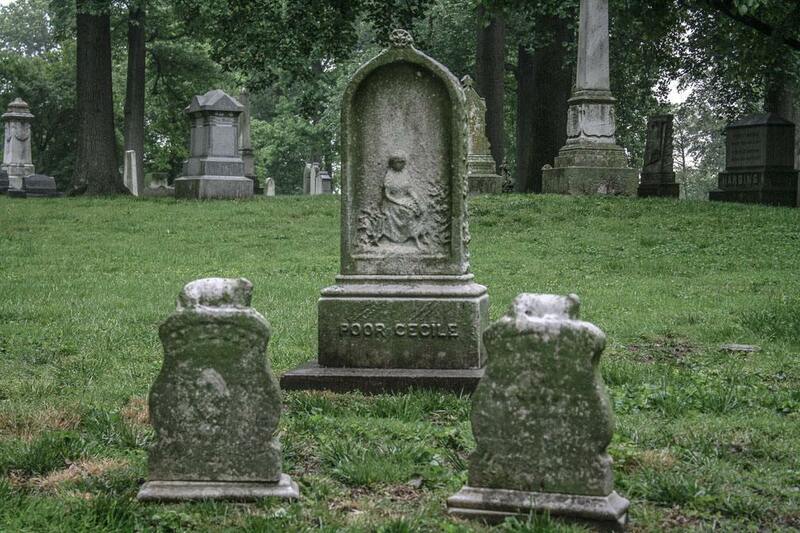 At the time, existing graveyards in St. Louis, often poorly maintained, were too small to accommodate its booming population; many would have to be abandoned to allow for the city’s expansion. Bellefontaine became the nation’s 14th rural cemetery — and the first one west of the Mississippi River — when it opened in 1849 in a quiet setting that allowed the deceased to rest in peace far from the noise of the city and the visitors to reflect on and remember their loved ones in a dignified, natural locale. Since then, 14 miles of curvy roadways, two lakes, and more than 4,000 trees and 1,100 shrubs have been added to the cemetery’s 314 acres. About 87,000 people have been interred here, and as I crept along in my car, reveling in the wild weather, I began to hunt for some of the sites the staff had pointed out. One of the first notable gravesites I found was the gray-granite obelisk that marked the final resting place of William Clark, who outlived his partner, Meriwether Lewis, by nearly 30 years after the two completed their legendary 28-month round-trip trek from the upper Louisiana Territory to the Pacific Coast in present-day Oregon. Writer Irma S. Rombauer (The Joy of Cooking) and Pulitzer Prize–winning poet Sara Teasdale. James B. Eads, a structural engineer whose iron-clad gunboats ensured a victory for Grant at the critical and tide-turning siege of Vicksburg during the Civil War, and who built the first bridge of steel construction across the Mississippi River in 1874. Former Army Air Corps pilot James McDonnell, who gave birth to half of the aerospace manufacturing corporation McDonnell Douglas. Author William S. Burroughs (Naked Lunch) as well as his grandfather, William Seward Burroughs, who invented the adding machine. 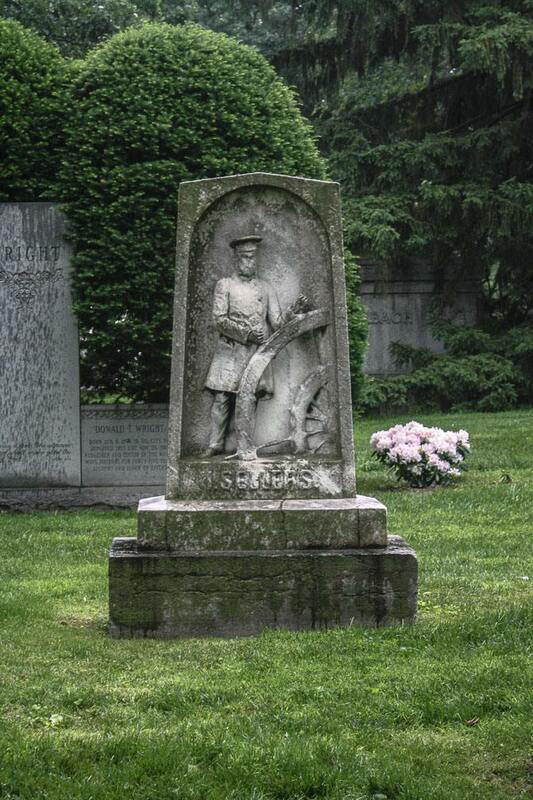 One of the world’s most successful brewers ever, Adolphus Busch lies in the cemetery’s grandest mausoleum. Obelisks, upright headstones, and flat markers occupied every hill and field, and a few Celtic crosses popped up here and there, but most impressive were the mausoleums — stately structures that not only reflected the important status of the deceased but also provided a private and safe haven for their visitors, especially on a turbulent day like this, when they would be (just as I was) the only people here. There was the Egyptian-style mausoleum for the Tate family, who owned most of the St. Louis theater property, and the domed tomb for Ellis Wainwright, the millionaire who commissioned Louis Sullivan to build the world’s first skyscraper. 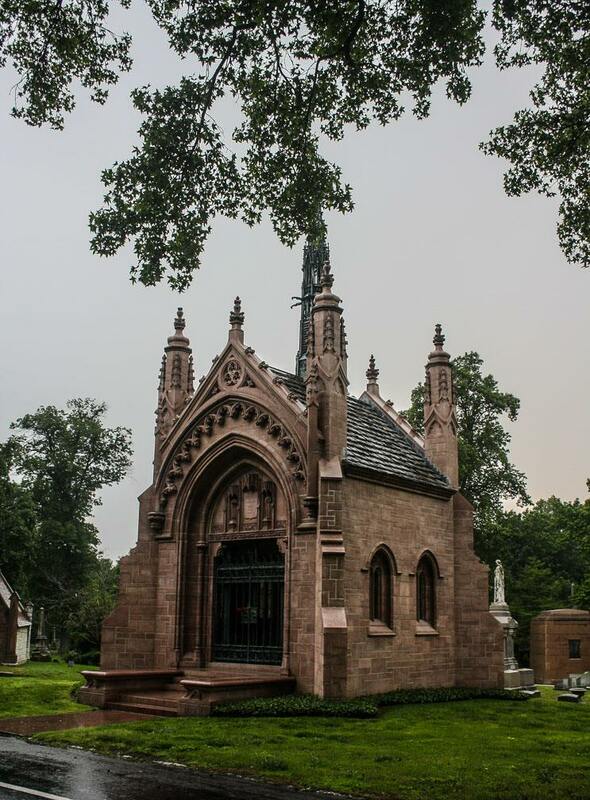 A hexagonal mausoleum for George Brown and a circular one for A.D. Brown were built for the two brothers who ran the Brown Shoe Company, which probably occupied a place in your childhood closet if you owned a pair of Buster Browns. Steamboat captain Isaiah Sellers wrote under the name Mark Twain long before Samuel Clemens resurrected it in honor of Sellers’ truthful writing. George Graham Vest, the Missouri senator who coined the phrase “man’s best friend” in reference to dogs when he was a lawyer making his closing statement while representing a farmer whose dog had been shot and killed in 1869. In between all these people who have affected our lives in one way or another were the occasional oddities. I was particularly taken with the story of Kate Bennett, wife of one of the cemetery’s founders, who was widely regarded as one of the most beautiful women in the city, attributed to both good genes and, at the time, her fashionably desirable ultra-pale complexion, which she achieved by ingesting small doses of arsenic — an act of vanity that gradually poisoned and eventually killed her, at age 37. Her memorial is a handsome Gothic canopy under which a mourning woman watches over Kate’s deathbed. 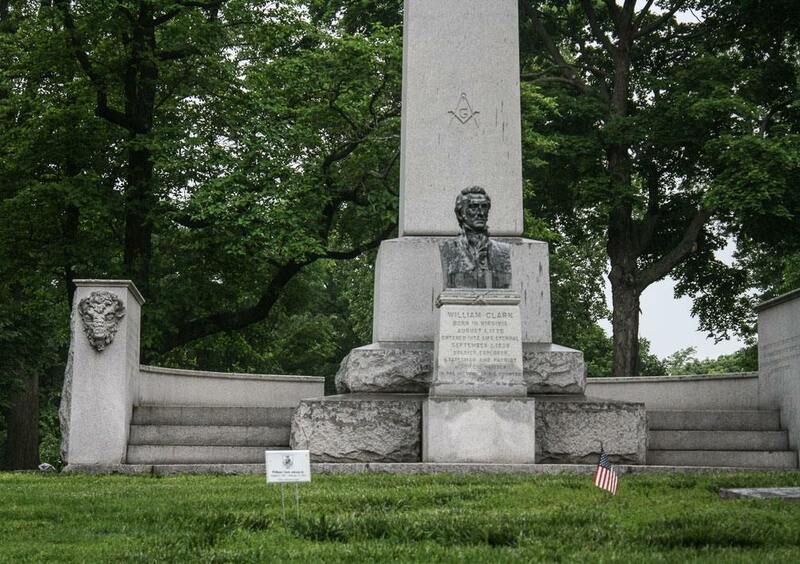 Just as the arsenic wore away her body, inclement weather (like today’s) is eroding the memorial. I also appreciated both the Lemp family tomb, the largest mausoleum in the cemetery, for a family of German immigrants who became tremendously rich brewers and whose lineage died out after four generations of suicides, sudden heart attacks, and insanity, leaving behind an allegedly haunted mansion, and the grave for James Eads How, the “Millionaire Hobo” who spent his fortune helping homeless migrant workers while living as one of them. No surname, no dates, and no birthplace give any indication about the life of Poor Cecile. I wondered about poor Cecile as the storm lifted and I made my way out of the cemetery. With no other information on her tombstone — no dates of her birth or death, no town where she was born, no indication if she was a mother or a sister or a niece — she seemed destined for an afterlife of obscurity, most likely the same fate of her earthly life. But in this egalitarian cemetery, where the astoundingly rich lie beside the devastatingly poor, she seemed to fit right in, and now she has at least one person who will remember her. Lovely! I’m glad to see I’m not the only person who likes exploring cemeteries in the rain. I’ve never been to Bellefontaine, but it’s on my list. Thanks! What could be better? Hope you get to Bellafontaine soon!